Nalbound items made with this stitch have been found from West China, Tarim Basin area (1000 BCE), Peru (about 100 CE), and Egypt (about 400-600 CE). The front side of the Coptic Stitch (Tarim Stitch) looks like knit stitches, but the loops are twisted and upside down compared to true knit stitches. On the photo on the right, there's also a small test in ribbing, and two-coloured work. 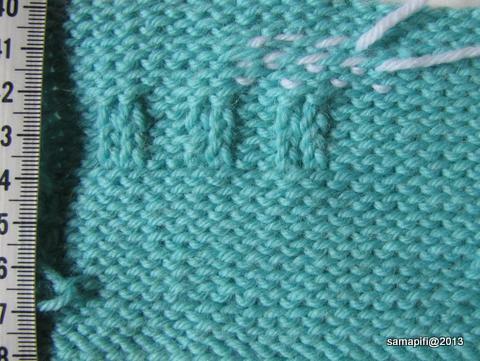 When stretched, the twisted loops become smaller/narrower, and the gaps between two stitches become larger. A knitted piece stretches more evenly. 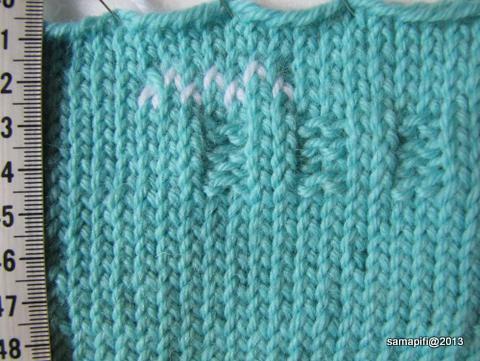 The ribbing on the other hand, does not pull together nearly as strongly as knitted ribbing. Most items made by nalbinding do not ravel on their own, if there's a hole for example in a sock sole. Coptic Stitch (Tarim Stitch) is an exception. When working with Coptic Stitch (Tarim Stitch), you cannot undo the work like knitted or crocheted item, ie by pulling the yarn, but if there's a hole, the stitches may start running from bottom up.